Stuffing is one of the essential dishes of a good Thanksgiving dinner. And there's nothing wrong with having more than one option. I always make a fairly traditional sausage-corn bread stuffing, but if I make second one, it gives me a chance to experiment. 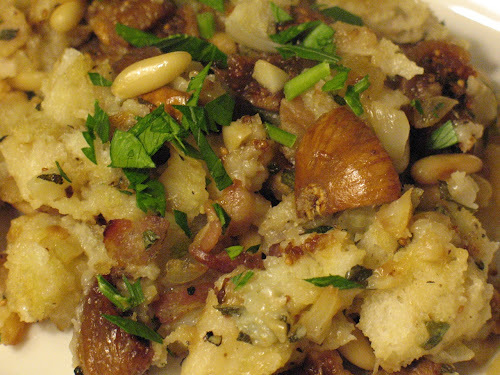 Like the Oregon stuffing last week, this dish has a theme: I went with Italian flavors, using Italian bread, pancetta (Italian bacon), pine nuts and figs to give Mediterranean flair to this hearty dish. A similar recipe by Delish helped me conceive this dish. 1. Preheat oven to 375 F. Toss bread cubes with olive oil, place on a baking sheet, and bake until the bread is dried out and lightly browned, about 15 minutes. Set aside. 2. In a small frying pan, over medium-low heat, toast pine nuts until lightly browned. Set aside. 2. Heat a large frying pan over medium heat. Add pancetta and fry until cooked through and crisp, about 8 minutes. Remove from pan, leaving drippings to sauté vegetables. Add onions, fennel and garlic and saute until softened, about 10 minutes. 3. Return oven to 375 F. In a large bowl, combine toasted bread, crisped pancetta, toasted nuts, cooked vegetables, and all remaining ingredients. Transfer to a 9 X 13 baking dish. Cook in oven until browned on top and sizzling, about 30-40 minutes, stirring every 10 minutes. Stuffing is always my favorite Thanksgiving dish and this one was quite good. I think I prefer it to the Oregon stuffing, but they're both really yummy.